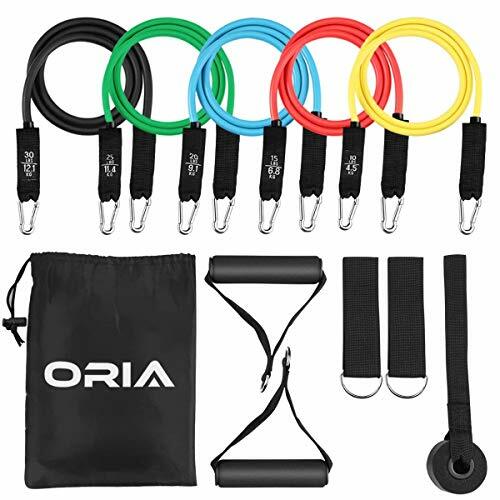 Our resistance Band Set with different color mark and model, is not only Simple and stylish, but also suitable different training goal, you can select color and model as you like. Ideal friend for fitness. Environment-friendly Band: The resistance band is made of 100% genius eco-friendly latex without irritating odor, also is strong and durable, includes 5 Resistance Bands, 2 x Cushioned Foam Handles, 1 x Door Anchor, 2 x Ankle Straps & 1 x Carrying Bag. Widely Uses & Portable Design: Whether you're a beginner or an expert, these resistance bands are for you. You can use it to train your legs, arms, back, shoulders, ankles etc. Also, you can put them in the carry bag to anywhere you like. 5 Colors Resistance Bands : Yellow(10lb), Red(15lb), Blue(20lb), Green(25lb), Black(30lb). The bands can be used alone or stacked in any combination to achieve your optimal resistance level up to 100lb. You can choose your execrise level you like. Sweatproof Foam Handles & Durable Door Anchor & Wide Ankle Straps: The handles of the resistance band is made of eco-friendly foam with non-slip function which can avoid slipping after sweating. Door anchor is strong and durable that can use it repeadly, ankle straps are wider and more comfortable than others on market. Lifetime Guarantee: Our Resistance Bands Set come with a 100% satisfaction guarantee. If you are not completely satisfied with your resistance bands, we will refund your purchase or send you a replacement free of charge! ORDER NOW! ENJOY YOUR SHOPPING.